Review: A Shift In Time, Lena Einhorn. A new hypothesis on the origin of the Jesus narrative. 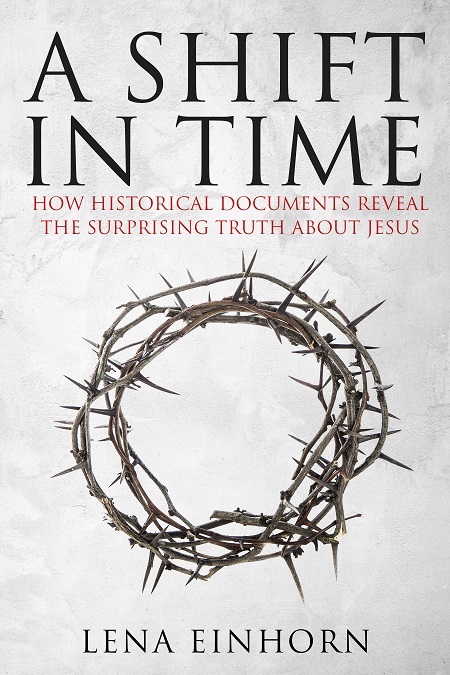 I recently completed reading A Shift in Time: How Historical Documents Reveal the Surprising Truth About Jesus by Lena Einhorn. Lena Einhorn proposes a radical rethink of Christian origins and does so in a welcome methodical and understated manner. Far from being a sensationalist weaving of data into a mesmerizing filigree of yet another conspiracy or gnostic theory, Einhorn lays out clearly and concisely the evidence that she believes has been overlooked and on the whole leaves it to readers to draw their own conclusions, keeping her own conclusions largely in the background. By the time I had finished the book I found myself thinking that if there is evidence for the Jesus of the gospels being based on a historical person it could well emerge through an argument like Einhorn’s. While I am not ready to embrace her own conclusions (I think much more data needs to be thrown into the mix for a full explanation) her book nonetheless raises very interesting questions. The dust jacket blurb includes the line by Professor Philip R. Davies, “this book should make us think.” And it does. Anyone familiar with the Gospels and Acts who has out of curiosity also read Josephus has surely been struck by periodic reminders of what we find in the New Testament narratives and thought, “Interesting, but of course it can be nothing more than coincidence because the Jesus story happened much earlier.” By taking these “coincidental” allusions and analysing them more systematically in comparison with the Gospels and Acts, Einhorn asks us to think through their implications and address new questions. Einhorn’s thesis is that many allusions and apparent anomalies in the Gospels and Acts coincide with and find historical setting in the events and personalities in the two decades leading up to the Jewish War with Rome. That is, about twenty years after the New Testament historical setting of the Jesus narrative. Sometimes further support for this “shift in time” comes from other sources (both Christian and Jewish) outside the writings of Josephus. Einhorn has a gift for presenting complex data in a clear and comprehensible way for anyone not familiar with the history of the various regions around Syria-Palestine in the first century, or with the fundamentals of historical Jesus scholarship. Her frequent bar chart and table illustrations assist the reader in keeping track of the multiple parallels between the history found in Josephus and the Gospel-Acts accounts and their respective chronologies. Each brief chapter expounds a single thematic parallel. An example of the parallels discussed: In the Gospels-Acts narrative we find reference to the death of Theudas preceding the death of Jesus; allusions to activity of rebel-bandits and the crucifixions of them; a hostile Galilean-Samaritan rift; an attack on an otherwise unknown Stephen that precipitates a new wave of widespread violence; two contemporaneous high priests, conflict between the Roman procurator and a Jewish king; a Roman slaughter of Galileans; a visit of a messianic figure to the Mount of Olives just prior to the violent dispersal of his following . . . . None of these phenomena are testified beyond the New Testament to have been found in the time of Jesus and early Church (around the year 30 CE), yet curiously all are found recorded by Josephus about twenty years later. As one who has also tried to draw attention to the absence of evidence for popular messianic fervor in early first century Judea I found Einhorn’s observations very attractive. Are the parallels “real”? Einhorn herself raises this question several times but has enough respect for readers to allow them to decide. She is content to point out the unusual concentration of them within a narrow time frame and it is this detail that cries out for an explanation. We know coincidences do happen, sometimes quite complex ones. Recall the parallels between the Lincoln and Kennedy assassinations even allowing for some exaggeration and invalid data. We do have a natural tendency to find patterns “even where none exist”. At the same time scholars studying the Gospels in relation to the wider literature of the day (e.g. Dale Allison Jr, Andrew Clark, Dennis MacDonald, Thomas Brodie are just a few examples whose work has been discussed on this blog) have established criteria for identifying “real parallels”. Two criteria that regularly appear in such lists are the density of the parallels and their ability to generate new understanding of how and why the text may have come about. This is where the strength of the parallels in Einhorn’s thesis lies. How to test the thesis?